This recipe for sweet potatoes is about as simple as it gets: just peel, chop, top with butter, and bake. The only tricky part is the chopping--please watch your fingers and use an appropriately-sized sharp knife for the job. You can leave the peels on and even eat them if you want to...just be sure to scrub the potatoes really well first. Preheat oven to 350° F. Rinse the sweet potatoes and peel with a vegetable peeler, working away from yourself to avoid your fingers. (As an aside, don't put the peelings down the disposal...I did this once and it took an expensive visit from the plumber to sort things out!) 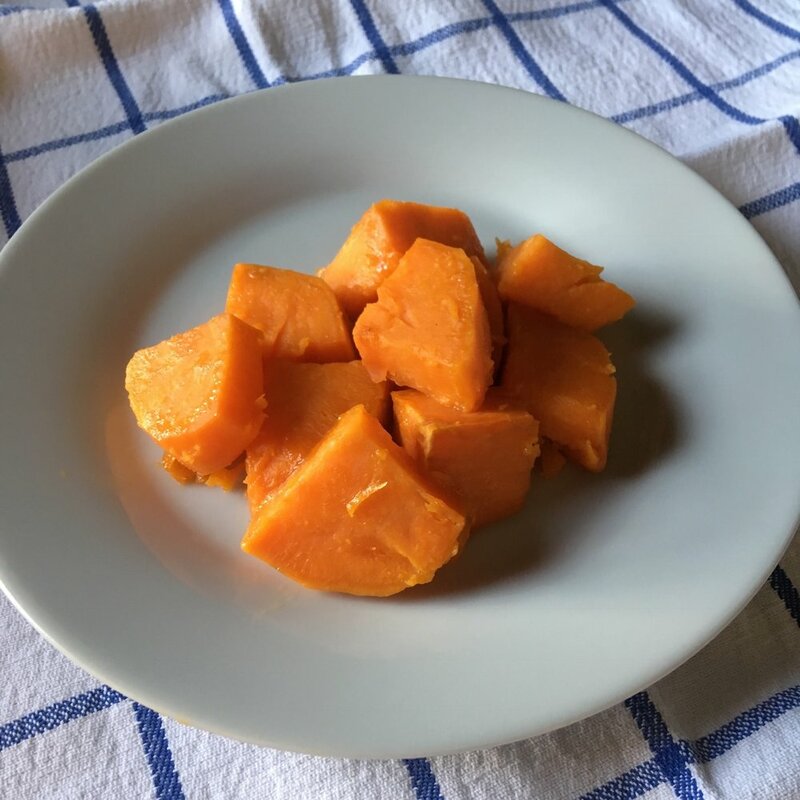 Using a sharp knife, carefully cut the sweet potatoes into bite-sized chunks: cutting them into rounds and then into quarters usually works for me. Place in an ungreased 9 x 13 glass baking dish, top with little slices of butter, and cover tightly with aluminum foil. This allows the sweet potatoes to steam as they cook, turning out flavorful results in less time. Bake covered for 30 minutes, then carefully remove from the oven and check for doneness--watch out for hot escaping steam when you take the aluminum foil off the top. The sweet potatoes should be tender, and no longer crunchy or hard. If you over-bake them, it's okay--they will just get kind of mushy after awhile but are still edible. If they're still crunchy at 30 minutes, cover and return to the oven for about 10 minutes at a time until done. Serve hot with savory (salt & pepper) or sweet (cinnamon & nutmeg) toppings. Enjoy!